Bring water to boil and add the thai tea mix or the 4 black tea bags. Add sugar and gently stir to completely dissolve sugar. Gently boil tea for about 3 minutes. Remove from heat. Allow tea to steep for at least 30 minutes and allow it to cool. The more concentrated the tea flavor, the better the Thai tea tastes. If you are using the Thai tea mix, strain the tea leaves. Set finished Thai tea aside to cool. If you are using black tea bags, remove the tea bags and set aside finished Thai tea to cool. You can make this ahead of time and have the Thai tea chilling in the fridge. Fill glass with about 3/4 full of the Thai tea mix. Then top off remainder of glass with half and half. Peel, pit and thinly slice mangoes lengthwise. Seed, core and thinly slice red pepper. Set aside. Dressing: In large bowl, whisk together oil, lime rind and juice, fish sauce, sugar, hot pepper, salt and pepper. Add mangoes, red pepper, red onion, coriander and mint; toss to coat. Serve sprinkled with peanuts. In a bowl, work together the fish, onion, potatoes, chillies, ginger, salt and black pepper. Grease your hands then take small pieces of the mixture and shape into triangles. Brush each triangle with beaten egg then roll in the breadcrumbs to coat evenly. 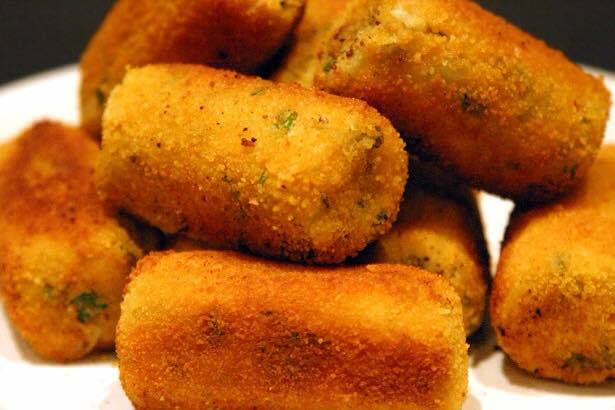 Heat the ghee in a pan and use to shallow fry the croquettes until golden brown all over. Remove with a slotted spoon, drain on kitchen paper then serve hot accompanied by your choice of chutney and shredded onion. Cube fruit and apply to skewer. Plate and serve. In a large enough pot, bring the 10 cups of water to a boil. Once the water is boiling, add the rice, the salt, and one cinnamon stick and continue to boil for about 30 minutes, or until the rice is quite mushy. Remove the pot from the heat and set aside to cool. At this point, also remove the cinnamon stick. While the rice is still a bit warm, add the sugar and vanilla extract and stir by hand. Add the powdered milk little by little so it doesn’t clump up, and stir by hand. Let the mixture cool down a bit longer. Using a blender, liquefy the mixture. You will probably need to do this about 2 cups at a time, because the entire batch will not fit in an average size blender. Put the mixture in a pitcher and in the fridge to cool down completely. Once cool, you can serve it in many different ways. You can serve it with crushed ice, like a smoothie. Or you can serve it with ice cubes. But it’s always served with ice. You can sprinkle some ground cinnamon on top, and you can also add some condensed milk. Split arepas and stuff with desired fillings. Put the tea into a pan of water and let it boil a short moment. Now add about the same amount of milk to the water, and boil the mix again. Instead of stirring, the Mongolians will lift out some liquid with a ladle and let it splash back from a certain height. This brings enough movement into the liquid in the flat pan on the yurt stove. In the end, season to taste with salt and strain into a teapot. This tea is served in little bowls. It is the standard beverage to every meal. Put Granulated sugar and milk into a saucepan. Heat gently, stirring constantly until Granulated sugar dissolves. Add sweetened condensed milk, butter, salt and golden syrup. Stir until butter has melted. Bring to a boil and continue boiling until the soft ball stage, stirring occasionally to prevent burning. (Drop a little bit of the mixture to a cup of cold water, if the mixture forms a slight ball then it is done). Remove from heat. Cool slightly. Beat until thick. Pour into buttered tin. Mark into squares. Cut when cold. Dough: In a medium size bowl mix together flour and salt. Make a well in the center and gradually pour in water. Pull in flour from the side of the bowl until well mixed in and you have formed a dough. Place dough on a clean work surface and knead with your hands until dough is smooth.Add more flour or water if necessary. (You can make the dough in a stand mixer as well. Simply place flour, salt and water in bowl of mixer and mix for 5 minutes). Place dough in a bowl, cover and allow dough to rest for one hour in the refrigerator before using. Filling: In a large bowl, combine lamb, onion, scallions, garlic, coriander, salt and pepper. Mix until everything is well combined.Have ready a small dish of vegetable oil or some lettuce leaves. 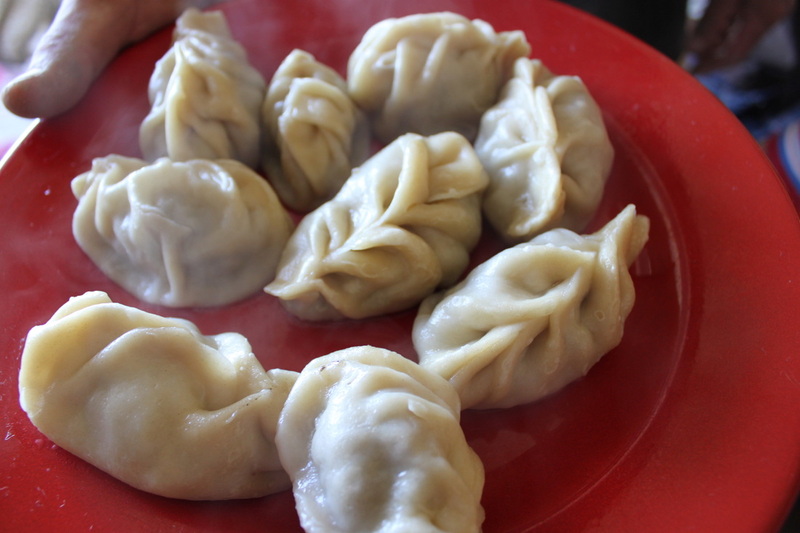 Dumplings: Remove dough from refrigerator, knead for about a minute then roll it out into a log about 1-inch in diameter.Cut the roll into 1-inch slices. Roll slice into a ball and lightly dust with flour. Flatten it a bit, then roll it out into a circle about 4-inches in diameter. Make the center slightly thicker than the edge. Hold one dough circle in your hand and place about a teaspoon of filling in the center. Pinch the edge on one side, then create another fold next to it. Continue this way while rotating the buuz as you go along. If done correctly (and we had our issues) there will be a small opening in the center of the top. Dip the bottom of each buuz into a bit of oil, or line a steamer rack with lettuce so that buuz does not stick to the rack. Arrange buuz on rack so that they do not touch.We used a bamboo steamer. If you don’t have one, a flat pasta strainer or even a cake rack would work just as well. Place the steamer in a pan or wok that has about 2-inches of water in the bottom. Water should not touch the dumplings. Bring water to a simmer, place steamer into the pan and put the lid on the steamer. Steam for 15 minutes without removing lid. First, chop onion, garlic, and green chili and sauté in oil over medium heat until onion and garlic are browned, about 7-10 minutes. Add coriander, cumin, pepper and salt. Add chopped tomatoes and cook in oil until the liquid from tomatoes has evaporated, and oil turns red, about 5 minutes. Add okra, potatoes, and water. Cover and boil over medium heat until potatoes are soft and most of the liquid has evaporated, about 20-30 minutes. Watch the vegetables to make sure they do not burn. 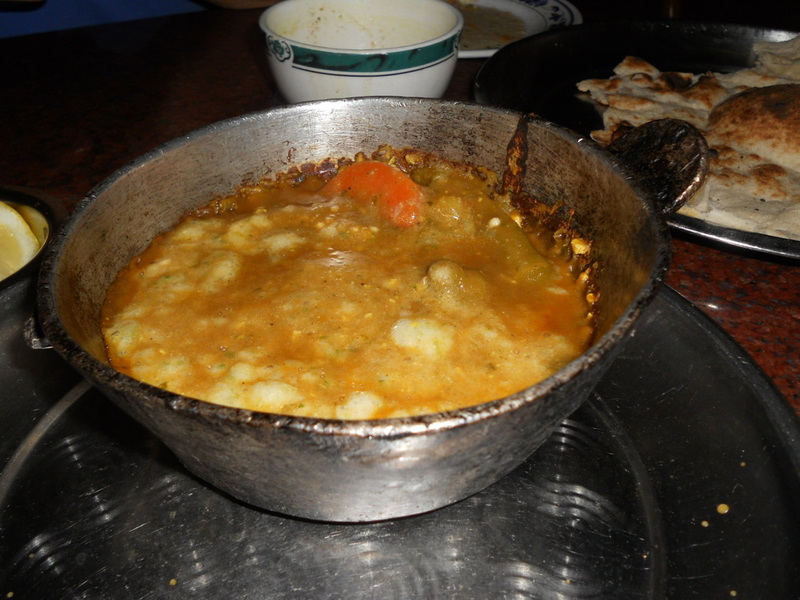 To make saltah, place the stewed vegetables in a stoneware pot on the stove. Make sure your pot is burner-safe and will not crack over high heat. Break up vegetables into small pieces with a spoon. Add just enough water to make a broth, about ½ cup. Don’t add too much water or the taste will be diluted. Add an extra pinch of salt and pepper to taste, and a few chopped green chilies on top of vegetables if desired. Also add as an option, 1 egg or beef broth. Heat on medium heat until bubbling. Let sit for a few seconds before serving piping hot. Serve with bread. Dissolve the yeast in 1/4 cup water. Mix flour, 4 eggs, 3/4 cup butter, salt, and yeast/water mixture together and knead for 10-15 minutes by hand or using a mixer. At this point, add the extra water slowly until the dough is soft and smooth but does not stick to your hands. I used about 1/4 cup additional water but this may vary depending on the climate where you live. Alternatively, place ingredients in bread machine on dough cycle until well kneaded. Cover and let dough sit and relax for 10 minutes.Divide the dough in 8-10 pieces. Form each piece into a smooth ball with your hands and place on a flat surface, coat lightly with oil and cover with a towel. Let the dough rise for 30 minutes. Grease a 14-inch round cake pan (you can also use a 12 or 10-inch pan) and set aside. Take one dough ball and toss it out by hand or roll it out on clean flat surface until it is very thin and you can see through it. Place this layer into the bottom of the pan and drizzle with some melted butter. Repeat this process for all 10 layers, each time adding a little bit of melted butter on top of each layer, except for the top layer. 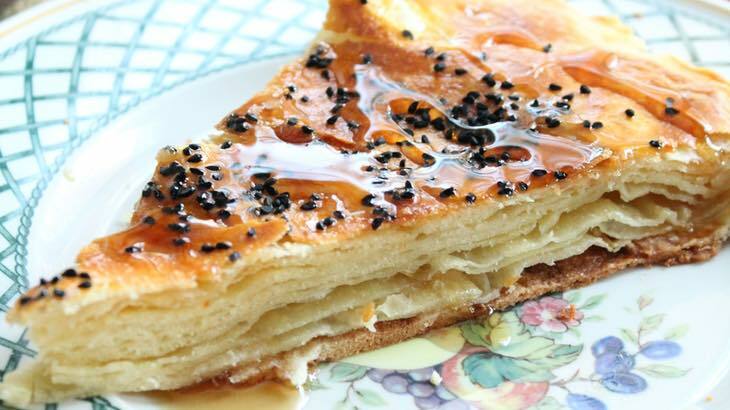 Brush the top layer with one beaten egg yolk and sprinkle with black cumin seeds or sesame seeds. Place in preheated oven at 400 degrees Fahrenheit for about 18-20 minutes or until cake is golden brown. Mix flour, baking powder and salt together. Add warm water. Knead until dough is soft but not sticky (add more warm water if needed). Cover bowl and let stand about 15 minutes. Pull off pieces of dough and pat into round shapes about 1/2" to 3/4" thick. Make a small hole in the center of each round. Melt lard in a heavy frying pan. One at a time brown each round (on both sides) in the hot fat. Good with honey or jam. (Serves 6) Preheat oven to 350° F. Lard roast (see below). Season roast with salt, pepper and thyme. Heat oil and butter in a frying pan over medium high heat. Brown roast on all sides to a deep brown. Remove meat and set aside. Add onion, garlic and bay leaves to the pan and fry until golden brown and soft. Place roast onto 2 or more layers of aluminum foil (places crosswise) and arrange onions on top of meat. Close foil tightly, set in a frying or roasting pan and place into the oven. Bake for 3-1/2 to 4 hours. Remove roast from foil when done, slice and arrange on warmed plates or platter. Pour onion and meat juices on top. Can be served with fried potatoes and carrots or a salad.